One evening in late October 2007 Neil Platt returned home after a busy day at work. Platt, 33, an architect, walked through the door of his London house and immediately sat down. Without taking off his coat, he removed his shoes and socks to inspect his toes. There was something not quite right with his right foot. Neil told his wife, Louise, that he had been limping during the day but that, oddly, he was not in pain. The foot seemed to be ‘slapping itself’ on to the ground. Louise reassured him that it was probably nothing, suggesting he might just need new shoes. But there was something else. Neil now noticed that he could not the lift the toes on his right foot as high as he could those on his left. He made an appointment to see his doctor. Louise was not unduly worried until Neil returned from the appointment: the doctor had given Neil his personal mobile number, insisted he undergo several tests and, because of Neil’s family history, referred him to a neurologist. Neil had his suspicions about what was wrong; Louise was less convinced. But when Neil’s mother came to visit a few weeks later and saw her son limping towards her at King’s Cross station, she knew immediately what the matter was. The last time she had seen that limp was on her late husband. Neil’s father, David, had died at the age of 50 from motor neurone disease (MND), which had also killed Neil’s grandfather at 62. His father’s death had made Neil acutely alert to the first symptoms of the disease. When he was 22 he had been to see a genetics specialist in an attempt to assess his chances of developing it. After six months of research the specialist came up blank. He could only say there was a 50-50 chance that Neil was a carrier of the same defective gene as his father and grandfather, and even that was a guess. But on February 7 2008, after doctors had eliminated every other option (there is no specific test for MND), Neil was diagnosed with the disease. MND is a brutal, merciless disease that rapidly causes physical deterioration, leaving sufferers unable to walk, swallow and eventually even breathe on their own. Someone with MND can typically expect to live about two years from diagnosis. It affects 5,000 people in the UK, with about 1,000 people diagnosed each year. More men than women are sufferers, and it is predominantly a disease of middle and later years (Neil was at the younger end of the spectrum). Although there is a genetic factor for some of those affected, the science is unclear on the causes. But while more than £300 million is spent annually on cancer research in the UK, the average annual spending on MND research is £2 million. There is no treatment for MND, just management. So far only one drug, riluzole, has been developed for people with the disease. Riluzole can slow the rate of deterioration and extend life by, at best, about six months. One often hears stories of people battling and beating cancer, but no one beats motor neurone disease; once Neil was diagnosed, everyone knew how the story would play out. They married in November 2004 in a Scottish stately home. In the wedding video Neil can be seen, in a bow tie, kilt and sideburns, dancing with Louise in the evening ceilidh. They moved to south London, and Louise became pregnant. Their son, Oscar, was born in August 2007. 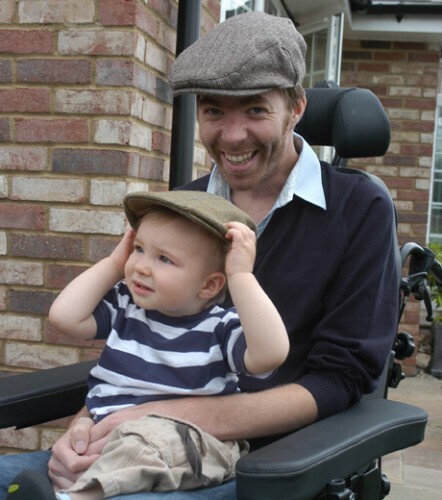 By the time of Oscar’s first Christmas, Neil and his doctors were fairly sure that he had MND. As the disease took hold, Louise found herself having to look after two dependent males. By Christmas 2007 Neil was supporting himself with a stick; by the next April he was in a wheelchair. There were times when the disease progressed with alarming speed. It must have been hard to reconcile yourself to this turn of events, I suggested. But did you ever give in to self-pity or envy at those not in your position, I wondered. Louise replied by telling me a story. The family had gone on holiday to Menorca with some of Neil’s relations. Oscar was ill with a tummy bug. One morning he woke early and Louise pulled him into bed, whereupon he had diarrhoea. ‘I remember putting Oscar into the bath to wash him,’ she recalled, ‘and I turned and Neil was standing in the doorway on crutches. Then suddenly he crumpled and was on the floor.’ That low point prompted Louise to change her outlook. ‘I switched my thinking from self-pity to thinking how privileged I was to be going through this so closely with Neil as he went on this part of his journey through life,’ she said. Neil’s condition meant that Louise needed at least two other adults in the house at all times, three if possible. ‘I had to fill the calendar with whoever I could get – friends, family, they all worked as a tag team and gave up their time,’ Louise said. ‘We also had two palliative-care team members every week morning who came to wash and dress him.’ And then there were the other specialists who were in and out of the house: the GP, district nurse, palliative consultant, social worker, occupational therapist, speech therapist, dietitian, physiotherapist, MND nurse specialist, respiratory specialist, bloods nurse and night sitters. There were so many people who wanted regular updates about his condition that in July 2008 Neil alighted on the idea of starting a blog – he called it Plattitude – on which he could share his daily news. It would be, he wrote in his introduction, ‘a tale of fun and laughs with a smattering of upset and devastation’. At the beginning the blog was Neil’s way of keeping in touch with those close to him, but as word spread and strangers began to read it, Neil realised that he could raise the profile of a misunderstood disease. The posts became much more frequent: from the end of December 2008, for the next two months, he posted almost every day, however much physical discomfort he was in and whatever his mood. If he couldn’t manage a post, he would ask Louise to write one for him. In summer 2008 Morag McKinnon, a drama director who had made a number of short films and who had known Neil and Louise since they were all students in Edinburgh, came across the blog. McKinnon contacted Emma Davie, a documentary-maker friend, suggesting they make a film about Neil. Neil immediately agreed to let the documentary makers spend several months filming him. The resulting film, I Am Breathing, has already been screened in 14 countries, with many more international screenings to come on June 21 – MND Global Awareness Day. Fifty per cent of the profits will be donated to the MND Association, the other half invested in outreach work. The film is bleak, unflinching and moving, yet morbidly funny. In one scene Neil describes trying to arrange for his phone to be disconnected. ‘They filmed everything they could,’ Louise said. ‘They interviewed Neil, they interviewed me and they made sure they got the general drudgery of running the house.’ We see Neil in his wheelchair, a ventilator tube obscuring his face while his son plays on the floor around him. We see him worrying about what questions Oscar will ask about his father in 10 and 20 years’ time, and we also see Neil constructing a memory box filled with objects to remind Oscar of his father as he grows up: a wallet, a leather jacket, a hat, a watch. It is clear that Oscar provides Neil with the strength to face the disease and keep going. On February 24 2009 Neil dictated his final blog post to Louise, a scene that is shown in I Am Breathing. In a dimly lit room Louise listens as Neil, his voice muffled, whispers, ‘The reason I have chosen to go to the hospice tomorrow is to draw the curtains over what has been a devastating, degrading year and a half.’ Quietly sobbing, she notes his words with one hand while tenderly stroking his hair with the other. Neil Platt died the following day. He was cremated wearing a T-shirt emblazoned with the face of the action star Chuck Norris. The song he had requested to be played during the cremation was Bon Jovi’s Wanted Dead or Alive.